Mastering good listening skills is to become aware of why listening is important in your life and your relationships. And the next step is simply to start doing it. Practice active listening whenever you can. – Never interrupt when the other person is speaking. Allow the speaker to complete his or her thought. – Eliminate distractions (put your IPad, your iPhone, your book down or turn off the TV). – Maintain eye contact while the other person is speaking. – Pull your chair closer and lean toward the speaker. – Keep your posture open (directly face your partner and leave your arms and legs uncrossed). – Give verbal and nonverbal responses to what the speaker is saying- “Yes, I see”, nod your head, smile, and frown when it is appropriate. Listening is more than passively remaining silent while the other person talks. It is the other half of an active collaborative process. The first level is attentive listening. In this mode we take the position that we are genuinely interested in the other person’s point of view. We accept the fact that we have something to learn from the interaction. However, this level of listening has its limitations. Even though we are attentive, we still make assumptions about the message ad we tend to fill in the gaps with whatever it is that we want to ear. At this level we don’t check to see if what we heard is what the speaker really meant to say. The second, and more powerful, level is active listening (or reflective listening). This assumes that communication is truly a two-way process that involves giving feedback. Active listening requires that the listener paraphrases, clarify, and give feedback. Paraphrasing is the most important element of active listening. When your partner says something of interest, you should restate in your own words what you heard your partner say. You can provide a lead-in, such as “what I am hearing you say is that…” or “So if I am correct, you are telling me that…” Paraphrasing allows us to correct misconceptions as they occur. Gives us the chance to resist obstacles to good listening, keeps both you and your partner from becoming defensive or feeling misunderstood, and helps us t remember what was said. Clarifying provides more depth to the listening process that merely paraphrasing. Your purpose in clarifying is to ask questions about what the speaker is saying in a helpful and emphatic way. 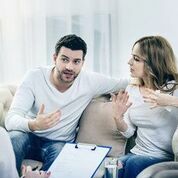 “so how did you feel when I cut you off?” “What did you think when I said I didn’t want to take that trip?” Clarifying does not involve belittling, manipulating or coercing your partner in any way. Its purpose is to tell the speaker that you are engaged in listening and want to know more about the specific points. Listening is a skill most of us never learned as a school subject. We assume that listening is something that comes naturally. Too often we listen for what we need to hear rather than to what the other person truly intend to say. Our inability to listen is often at the root of our interpersonal conflicts. Good relationships are characterized by good listening skills on the part of both partners. When we listen well to someone we not only show that person respect and care, but we are open to the world around us.